There are no concrete requirements for becoming a basketball player. Anyone can freely play the sport, whether you simply want to shoot some hoops in the backyard or have aspirations of one day having your own line of basketball sneakers and a million-dollar contract. But there are several factors — some of which you can control, and others you cannot — that will play a key role in determining how far your hoops career can go. A basketball team is usually very easy to spot in an airport. They're the tall guys. More so than any other sport, basketball is a game for tall people. The average American male stands 69.4 inches tall, or a shade below 5 feet 10 inches. The average American woman, meantime, is 63.8 inches — nearly 5 feet 4 inches. But these typical heights would often make you the smallest player on a basketball court. A typical NBA center stands in the 7-foot range. Guards, who are the smallest players on the court, often are above 6 feet tall. The reason: A basketball hoop is 10 feet high; so the taller you are, the more of a built-in advantage you'll enjoy. In order to become a successful basketball player, you need to have excellent endurance. In a study performed by the Victoria University of Technology and Australia, players performed 105 "high-intensity efforts" in a standard game, lasting an average of 14 seconds and elevating heart rates near peak levels. It's a fast-paced sport that at times can resemble a track meet in its near non-stop sprinting. Add to all of that the running, jumping, physical contact and other required body motions and you've got a sport for which you need to be in good shape to play well. 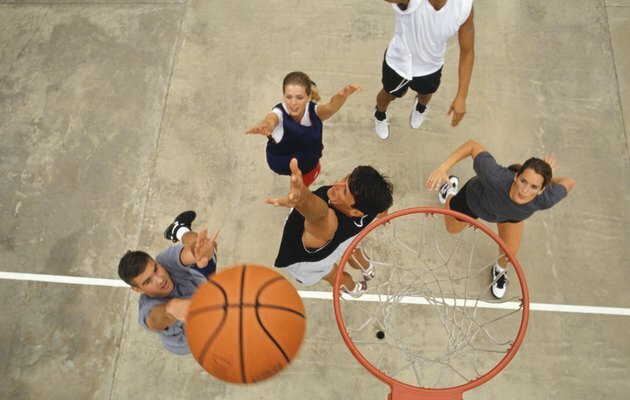 While height and endurance will aid your cause, basketball also relies heavily on athleticism. Basketball players often have a prodigious leaping ability, which aids in scoring, rebounding and blocking shots. It also helps you to be agile; the sport requires the ability to change direction frequently and suddenly. In fact, a study conducted by the National Center of Medicine and Science in Sports in Tunisia identified agility as a distinct commonality among the sport's elite players. Though basketball isn't considered a "contact sport" in the same way football is — you can't tackle a basketball opponent without being penalized — it does involve a good deal of physical contact. If you don't have the strength and toughness to keep your opponent from overpowering you on both offense and defense, you might struggle to succeed. Mental toughness is important as well; you must have the ability to keep playing with peak confidence even after missing several shots in a row or allowing your opponent to score baskets against your team.